Apart from an elegant design, Zune HD also brings in a lot of interesting and useful features. One of them is the compatibility with the 720p HD format (videos and photos), which permits the user to connect the Zune HD to an HDTV, thanks to the Zune HD AV Dock accessory. The first thing you need in order to do this is the Zune HD AV Dock (of course) which is sold separately, and which can be bought from the Microsoft Store for $90 or on Amazon for $20 less. 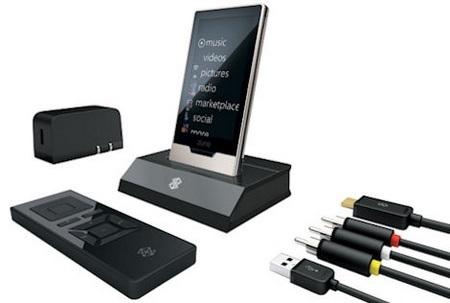 The Zune HD AV Dock consists of: a dock, a wireless remote, an AC adapter, an HDMI cable, an AV output cable and three inserts (for each Zune model). 1. Connect the HDMI cable to the dock and to the HDMI input of the HDTV or HD monitor. 2. Get the Zune HD and from the menu select “Settings”. 4. Select the option “TV output” and set it “On”. 5. Insert the Zune HD in the dock. 6. If you want to charge the Zune HD, connect the AC adapter to the dock. 7. To disconnect the Zune, go to the “TV output” (step 5) and select the option “Off”, or simply remove the Zune HD from the dock. 1. Connect the AV composite cable (the mini-jack plug) to the AV port of the dock. 2. Connect the AV red, white and yellow cables to the matching audio and video ports of your TV / monitor. Note: If your TV has only one audio input, then connect either the white or red cable of the AV cable. 3. Get the Zune HD and from the menu select “Settings”. 5. Select the option “TV output” and set it “On”. 6. Insert the Zune HD in the dock. 7. If you want to charge the Zune HD, connect the AC adapter to the dock. 8. To disconnect the Zune, go to the “TV output” (step 5) and select the option “Off”, or simply remove the Zune HD from the dock. Apart from the Zune HD, Zune HD AV Dock is also compatible with other Zune models, such as: Zune 4, Zune 8, Zune 16, Zune 30, Zune 80 and Zune 120. The difference is that not all Zune models can be used to play standard definition videos, but they all can be used to play music. The Zune models which are video compatible with the Zune HD AV Dock are: Zune 30, Zune 80 and Zune 120, while the remaining: Zune 4, Zune 8, Zune 16 are “audio-only” MP3 players. 3. Get the Zune 30 / 80 / 120 and from the menu select “Settings”. 6. Insert the Zune HD in the dock. Note: Pay attention to include the correct adapter plate, from the three available inserts, in the dock. 7. To disconnect the Zune, go to the “TV output” (step 5) and select the option “Off”, or simply remove the Zune from the dock.